It will gather together nearly 60 competitors from all around the world. The competition will be run from Doussard beach, at the southern tip of the lake. Pilots will take off from the Col de la Forclaz located in the commune of Talloires-Montmin. Competitors will take off from the Col de la Forclaz. Pilots will land on a raft anchored off the Doussard beach, where the members of the jury and the public are located. After the first practice days, a playoff phase will qualify the best pilots for the finals, to be held the the last days of the competition. Rounds take place in the afternoon. Given the vagaries of weather conditions, the competition program will be confirmed day by day. We will keep you informed of changes in real-time on this web site. Check out the “ideal” detailed program on the right. Usually it is best in the afternoon for visitors. Due to weather conditions, the program may change. Real time info on home page. COMPETITION will END ON SATURDAY, SEPTEMBER 3rd. 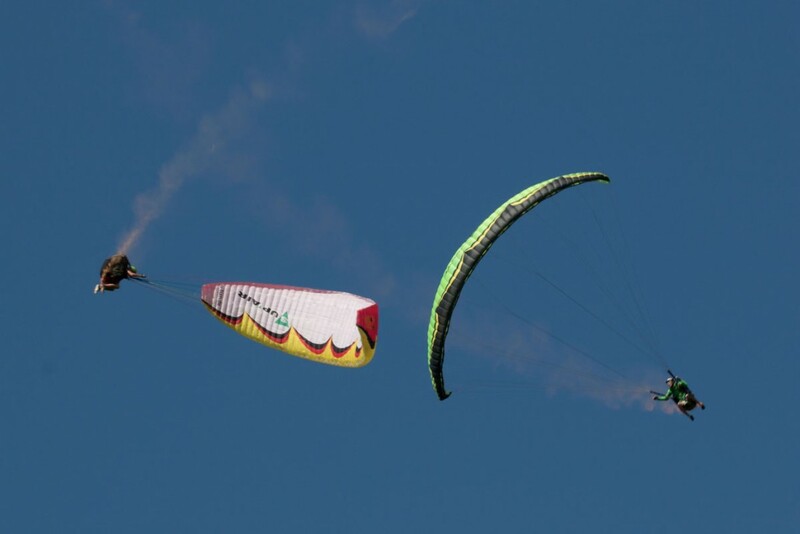 at 18:00/ Hall of Doussard (“Salle des fêtes”) located next to official landing zone for paragliders in Doussard. Live info on home page. This program can be adjusted depending on weather conditions. Morning: Solo run 7 with the first 20 rankin’s pilotes. Afternoon around 3pm: Synchro run 7. Hall of Doussard (“Salle des fêtes”) located next to official landing zone for paragliders in Doussard. This day was kept as possible overflow day in case of bad weather during the previous days. Due to nice weather during the week, it will not be necessary. Whether in the solo or synchronized categories, during each run pilots perform a succession of codified maneuvers. For championships such as these, pilots will perform around 5 to 6 runs over the week. Tricks performed during a run can’t be repeated in the following ones. This prevents pilots performing the same figures over and again and therefore makes it necessary that they master the full range of recognized maneuvers. For further information, download the FAI (Fédération Aéronautique Internationale) Sporting Code document that gives detailed explanations of the conduct of the competition – FAI link. Results will be available in real-time. 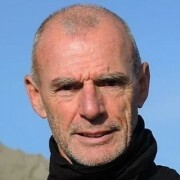 The task director is Jean-Marc Ardhuin. When you see a paragliding aerobatics competition for the very first time you are first captivated by the grace and the fluidity that emerges from the sequence of maneuvers. 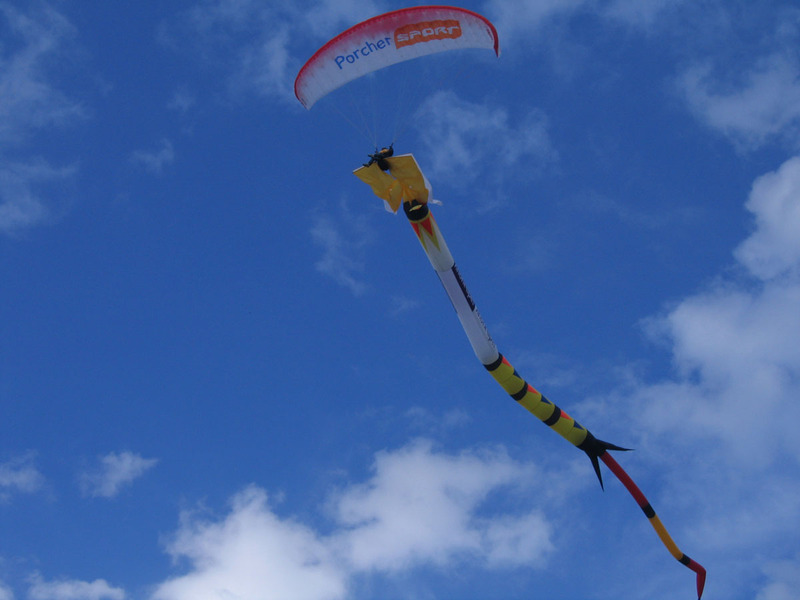 Then you come to understand the incredible mastery and the extreme precision required for the perfect execution of each move, reaching the highest art of piloting a paraglider. To achieve such results the pilots do an enormous amount of work, multiplying intensive training sessions and carefully measured risks. Late August, we will have the good luck to be able to see the work of the best pilots in the world, in one of the most spectacular environments. We welcome you all to the shores of Lake Annecy. Pilots, friends and families, and to the public that we hope will be numerous. We are sure that the spectacle will repay the hard work of all the volunteers and partners who have laboured to make these world championships a success. Member of the world championship organizers. This video faithfully reflects what you will experience as a spectator of these championships. This is the summary of the French championships that were held in 2014, also in Annecy at Doussard beach and at the take-off of Talloires-Montmin. All through the competition the public can admire spectacular tricks, but it is particularly in the final phase that the most talented pilots will bring out their most exceptional, even unique, figures. We hope to welcome many of you to Doussard beach all throughout the competition.